Luxe and Tex-Mex tussle at this Alamo Heights hangout. 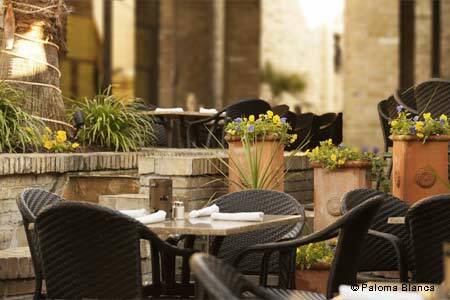 : The location in upscale Alamo Heights alone would put Paloma Blanca in a different category from the city’s standard Mexican joints; the appearance of celiac selections, and a “Paleo” menu as well, only cements the impression. But street-food items (at dine-in prices) such as tacos de la calle with beef fajitas do lend an air of authenticity. Earthy enchiladas divorciadas also strike an opposing chord in this swell setting (the patio is especially to be appreciated) that seems more suited to the ensalada Esmeralda with strips of roasted poblano pepper, or the same pepper stuffed with vegetables and Monterey Jack cheese. Yet, contemporary creations can often fall flat, with the pollo half-and-half a case in point; we’d do chicken with a topping evoking the mushroomy enchiladas San Miguel. One can, however, order enthusiastically from the margarita menu sporting neighborhood names such as "The Heights." At dessert time, you may ignore the chocolate version of the now ubiquitous tres leches cake in favor of the original.